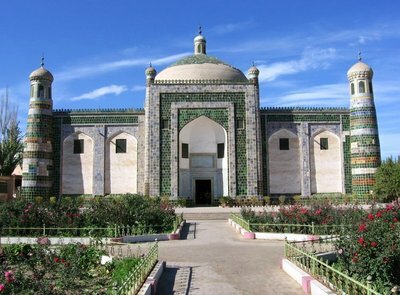 Hodja Apakh Mausoleum, Kashgar, East Turkestan – Photograph 2005 by Colegota, Via Wikimedia Commons. On the tenth anniversary of the September 11 terror attacks on the United States, the Uyghur American Association (UAA) mourns the loss of innocent lives lost in the senseless violence of that day. UAA stands united with the Americans of all backgrounds who are rebuilding their lives after September 11 and who have maintained an unwavering commitment to the democratic ideals this country was founded upon. "The American people have shown that they will not give up their freedoms in the face of extremism. Americans, and the rest of the world community that is striving toward a peaceful future, stand in stark contrast to those who seek to destroy our liberty and democracy," said UAA president Alim Seytoff. "The Chinese government, on the other hand, has used the tragedy of 9/11 to justify its wholesale attack on the Uyghur people and their Muslim faith, and it continues to use the rhetoric of 9/11 to harden its repressive policies." Authoritarian states have manipulated the global war on terror to justify their repression of oppressed peoples. Over the past 10 years, one such state, the government of the People's Republic of China (PRC), has maneuvered to exploit the events of September 11 to persecute the Uyghur people, both in East Turkestan and around the world. In the era of the "war on terror," the PRC government has attempted to link Uyghur dissidents and groups to international terrorism. Without presenting any evidence of a genuine terrorist threat, PRC authorities continue to defend their crackdowns in East Turkestan in the name of fighting the "three evil forces of separatism, terrorism, and extremism." The victims of this brutal campaign carried out under the global war on terror have been the Uyghur people. PRC officials hardened policies toward Uyghurs even further in the aftermath of unrest that took place on July 5, 2009 in the regional capital of Urumchi. Beginning on July 5, Chinese security forces carried out arbitrary detentions of Uyghurs, engaging in sweeping house-to-house searches and carrying out arrests in violation of Chinese and international law. More than two years later, Urumchi and other cities in East Turkestan remain tense, as Chinese authorities target Uyghurs' cultural and religious activities and enforce mandatory "ethnic unity" campaigns. Government officials have also used detentions and harsh prison sentences given to Uyghur journalists and webmasters in an effort to silence and intimidate Uyghur voices in post-July 5 East Turkestan. PRC officials have also exploited the Uyghurs' Muslim faith to suppress peaceful Uyghur dissent while gaining international sympathy for their cause. Chinese government officials have increasingly used Uyghurs' belief in Islam to portray them as fundamentalists and terrorists. "Religious extremism" has been placed alongside "separatism" and "terrorism" as one of the so-called "three evil forces". PRC leaders have increasingly used the Shanghai Cooperation Organization (SCO) as a vehicle to target peaceful Uyghur dissent in East Turkestan and Central Asia, enlisting the support of Central Asian governments in their attacks on Uyghurs. PRC leaders view the large Uyghur population living in formerly Soviet Central Asian nations as a threat, and have used bilateral agreements against "terrorism", joint military exercises and trade relationships under the auspices of the SCO to ensure that Uyghurs find no refuge from China's long reach in Central Asia. In recent years, PRC authorities have greatly accelerated the pursuit and harassment of Uyghur refugees who have fled the PRC for other countries. Chinese officials have used their diplomatic and economic influence to track down Uyghur refugees, not only in Central Asia, but also in South and Southeast Asia. In 2011, pressure from the Chinese government has resulted in the deportation of asylum seekers and other peaceful Uyghurs from Malaysia, Pakistan, Thailand, Kazakhstan and Laos. The deported Uyghurs are then vulnerable to torture, enforced disappearance, arbitrary detention, and execution in China. Chinese officials have refused to release information about the fates of any of the Uyghurs who have been deported from other countries in recent years.